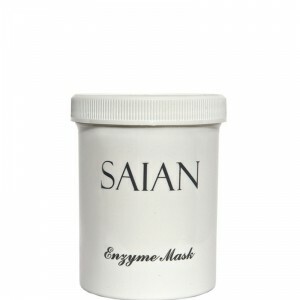 Saian Enzyme Mask. Effective enzymatic mask to remove dead skin cells, help to lighten skin, and discoloration. Excellent for acne. 4 oz. This unique and highly effective botanical enzymatic mask is specially formulated to liquefy and remove dead cells and impurities that accumulate on the surface of the skin. The mask's gentle, natural blend lightens the skin, activates cellular function, increases circulation, fades discoloration and leaves the skin feeling and looking fresh, smooth and healthy. Using this clay mask helps to pull out oils, exfoliate, and reduce the appearance of sun damage, wrinkles, cellulite and even stretch marks. Reduces pore size. Perfect for blemished skin, blackheads and even cystic acne. Excellent for soothing skin conditions such as rosacea, eczema, rashes, psoriasis, and acne. Paraben-free, artificial color-free, propylene glycol-free, unscented. No special activator required - mix the powder with warm water and apply for 10-15 mins. Comes with a natural fan-brush applicator. Mix Enzyme Mask with warm water in a non-reactive bowl. Blend to make a paste. Apply paste to the skin with an applicator brush, keeping mask away from the eyes. Leave mask on the face for 10 minutes under steam, or a hot towel. Colloidal Oatmeal: is a natural product which helps soothe and soften dry skin and relieve itchy skin rashes and irritations. Pineapple Enzyme: Fruit enzymes derived from pineapple help break-down and remove dull, dead surface cells for a glowing complexion. Mix a small amount of honey with Enzyme Mask. Mix it until it is all dissolved. You want it a cream consistency. Apply to the face and neck, preferably with a brush. Leave on 10 to 15 minutes and then rinse. Apply your favorite moisturizer. Your skin will feel more hydrated, firm and exfoliated. I have used SO many enzyme masks - high end - this is the BEST one. Excellent for super reactive skin. Removes blackheads and dissolves dead skin cells/bad skin- shrinks pores and shrinks acne and removes debris without irritating. Dermatitis sufferers will LOVE this! I LOVE SAIAN serums too!!! It lasts forever. No other mask like it. So Calming. I have only used this one time but was shocked at how great my skin looked afterwards. I look forward to even more amazing results as I use it. By. far the best mask I have tried to date. This mask sure cleared up my face. It was a mess. Now it is much more clear and no more redness.